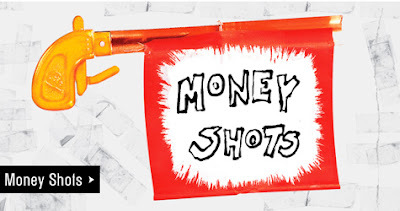 Sydney Theatre Company presents MONEY SHOTS as part of Next Stage 2011 at Wharf 2. The program tells us that we were to see 5 new fifteen minute plays about money from some of Australia's most exciting new theatre-makers: Tahli Corin, Duncan Graham, Angus Cerini, Rita Kalnejais, Zoe Pepper and the out going The Residents: Cameron Goodall, Julia Ohannessian, Zindzi Okenyo, Richard Pyros, Sophie Ross and Tahki Saul directed by the 2011 Richard Wherrett Fellow, Sarah Giles. The Sydney Theatre Company's Literary Manager, Polly Rowe (who recently acted as dramaturg on BOXING DAY at the Old Fitzroy Theatre) along with Tom Wright, Associate Director to the Artistic Directors, Cate Blanchett and Andrew Upton tell us that MONEY SHOTS originated when "á pool of grant cash that could be liberated to blow on commissioning young or emerging artists (was identified). Inspired by the opportunity to redistribute some wealth, we came up with the concept of a show comprised of five miniature plays, which would stand alongside one another to pick away at a giant theme. At the time of commissioning the plays, most Australians believed the GFC to be a bullet dodged but with the gun still smoking it felt like a fitting moment to muse on money .... without the input of economists or the output of calculators". They go on to say: "Our writers and devisor have responded to the artistic stimulus we offered by creating plays that examine financial crisis at its most human level. ...."
The key words in all this verbiage are "when a pool of grant cash could be liberated to blow..." for it was well and truly 'blown cash' . The quality of the writing and the superficiality of the approach to the world's GFC crisis is truly dire and truly of pygmy scale in contrast to what Ms Rowe and Mr Wright identify as a "giant theme", the present unfolding of the GFC crisis. No SERIOUS MONEY struggle here. No ENRON here. No THE POWER OF YES here. Just silly juveniles and broken marriages with perhaps a coin or a pile of notes thrown in the air or to the ground, literally, to remind us that these plays/sketches were to be "about money" Truly pathetic. Any real guidance and dramaturgy go on here? Hard to believe so. (Check what Mr Pinter might call a sketch. A play. He wrote both). I can not imagine these sketches will ever see the light of day again in any serious context.The whole event felt like an end of contract blow out concert that was meant only for the end of contractors to enjoy. An awful waste of cash and not a very interesting farewell showcase for these young artists after such a long moneyed contract with the Sydney Theatre Company. The best of them, THE ARCADE by Tahli Corin concerning itself with young adolescent love and the exploitation by a sexual predator, had money appear, only as a prop to be counted as a means to begin each of the episodes. This work had charm and harm revealed and gave Zindzi Okenyo and Tahki Saul a little gift to create two delightfully believable youngsters. In fact, this is some of the best work that Mr Saul has given in his residency with The Residents. Ms Okenyo sustained my belief in her range and credibility.The two actors played well together and made the sketch work. Ms Ohannnessian revealed a spontaneity and comic flair not featured before in her work, as part of her Residents tenure and the fact that she survived against the contrived and forced efforts of Mr Goodall in this very poor TV sketch by Rita Kalnejais, HOW TO GET VERY CLEAN - a static piece of writing that had more to do with hair than money, was a marvel to observe. NO EXIT FROM THE ROOF by Duncan Graham with Sophie Ross and Richard Pyros, had tiny vignettes of the breakup of a marriage barraged with some tribal chanting (Composer/Sound Designer, Stefan Gregory) every minute or so and ultimately the noise became the only memory of content. Not quite true. I do recall that this work by Mr Graham seemed to be free from his usual usage of the myths of the world to create a framework to pitch his content. In fact, MONEY SHOTS began to feel it was really the Cameron Goodall show, considering that he featured heavily in three of the five sketches. One of them: DRILL DOWN by Angus Cerini, who some of my friends have championed for the writing, but in my experience, became an isolated spotlit solo, where the content of the work was pushed out of focus to accommodate the excessive vocal consonant work of this craftsman. Tiresome. The last sketch directed by Zoe Pepper and written by Zoe Pepper, the Ensemble and Brett Stiller: FIDDLER'S COIN is best forgotten for the sheer banal concept and incoherent structure - surely, a late night party improvisation that only the late night party goers and their sponsored beer drinking friends could find in anyway amusing. Ms Giles demonstrated that there is a way to work with no real design support and did her best with sketch content not really worth her sweat and tears. A waste of her talent. What was the company really thinking here? This was awful. And a wasted opportunity. If cozened, and the details developed dramaturgically, it could have been interesting to see what these artists that the Sydney Theatre Company regards as "Some of Australia's Most Exciting New Theatremakers" could do with one of the more crucial issues of the day. I wonder what this lot would have done with Climate Change as their subject matter? Or Afghanistan or the Middle East crisis? I shudder to even speculate. Hi Kevin, It seems to me you are a VERY harsh judge. I have seen shows (including Money Shots) which i have enjoyed a lot and was quite happy with the show only to read your reviews where you have bagged out the actors' performance or something else about the show. However even though i often disagree with you i do enjoy reading your reviews and I generally learn quite a lot from them. I am often amazed at how highly critical you are. I suppose it comes with your experience of seeing a hell of a lot of theatre over the years, but for me as a person with less experience of our theatre history, i suppose to a certain extent i am just grateful for the performances, for writers who sat down for ages to write a show, and for the luxury we have of being able to sit in a theatre and experience the free creative expression of ideas by the writers directors and the actors. (well,..not exactly FREE $, but you know what i mean...) That's what i love about theatre. Sometimes I really think you are unreasonably harsh. It is true that I have a long history of theatre going and so my “bench mark” of good work has more depth than your relatively new journey, perhaps. I, too, go to the theatre to have a great time and an experience that will change me. The person I walk in as, I hope will be different in a positive way when I walk out. If the work is good I want everyone to see it. If not, I feel the audience need to have an informed knowledge to make the choice of spending the time and money with that production. And Niall, I am just one voice in the blogo-sphere. My prejudices towards work should be perfectly clear if you read me regularly, as it is with all voices/critics. I know from experience that all of us artists set out to do GOOD work, to give a great time, in all the meanings of that word GREAT. This is hard to achieve and requires rigorous application and preparation. When an opportunity is given DO IT WELL. There may be no other. For me my early adventures in the theatre have glowing “golden” memories which if I were seeing them now, at this end of my theatre going, I might not think so. If, you feel I have been “VERY harsh” to MONEY SHOTS, for instance, it comes from the perspective that this work, particularly, was produced by the SYDNEY THEATRE COMPANY, one of the leading national companies. Many claims were made in the program for this project: one, that the work had been commissioned especially to deal with the great theme of the GFC and the effects it may have had on the Australian experience. Two: it also was coming from “Some of Australia’s Most Exciting New Theatremakers.” The GFC was not a major theme of any of this work, and as far as I could discern it had no researched rigour of that theme, and if this represents “Some of Australia’s Most Exciting New Theatremakers” then it presents a dire future. Not many Companies can find a cash supply to produce this kind of work, the STC seems especially privileged to do so – the result was not very promising or enlightening to its commissioned theme. Because it is a collaborative art form , all the artists are ultimately responsible for the product. I regard everything that the production offers me as a deliberate and considered choice. If all the artists involved can honestly say we did our best, from the writer as the originating source of this creativity through to the light, sound set, costume , dramaturg, director, actor, voice and movement coach then they can quite rightly ignore my comments. If not, they might like to read my comments which come from the same place of their inspiration and aspiration, which is to create theatre that is meaningful for all the audience. I don’t go to the theatre to have a bad time. If you are working at this level of the standard of what expects from the most privileged company in Sydney theatre, the STC, then a lot should be expected. If this had been work in the Sydney Fringe Festival a different criteria of appreciation might have been applied. I tried to look at the work from that point of knowledge. The SYDNEY THEATRE COMPANY. Look at the reviews that the STC quotes to us of the UNCLE VANYA tour; THE STREETCAR NAMED DESIRE tour and tell me that this work comes anywhere near that rigour? Even as new work this was not good enough from this company. Thanks for reading my stuff. Thanks for your concern. I promise you I attempt to write to assist the quality of work. No one that I have ever been “VERY harsh” to, I hope, in my estimation of their talent could not have done better. I simply want to encourage them to think so, too. To maintain a pursuance of passion for the best quality work. An excellence, not, this will do. Opportunities are rare. Very rare indeed at the level of STC. With your theatre going experience, which you obviously enjoy, there will come a time, I hope, being “grateful for the performances, for writers who sat down for ages to write a show, and for the luxury we have to of being able to sit in a theatre and experience free creative expression of ideas by the writers, directors and the actors” will still be present but a degree of astute appreciation of what quality and truly committed work is, at the different strata of endeavour, becomes part of your antennae of appreciation. How lucky for those young artists to have had the opportunity to be involved with MONEY SHOTS. What was achieved? Hi Kevin, I appreciate your detailed response to my comments and thanks for taking the time. As i said to you in person when we met recently, i do see that you attempt to explain reasons for your opinions, so i supppose i was wrong to say you were "unreasonably harsh". It's just that i was trying to explain the gulf between my experience that afternoon in the theatre, and your own.